Coastal sage scrub (CSS) is a semi-arid shrub-dominated ecosystem found in southern California. CSS has been reduced to a tiny fraction of its original extent due to urbanization, conversion to agriculture and degradation by invasive exotic annual plant species. The increased presence of exotic annuals, such as invasive grasses like Bromus madritensis and Avena barbata, and forbs like Centaurea spp. and Brassica spp., alters the functioning of CSS ecosystems. 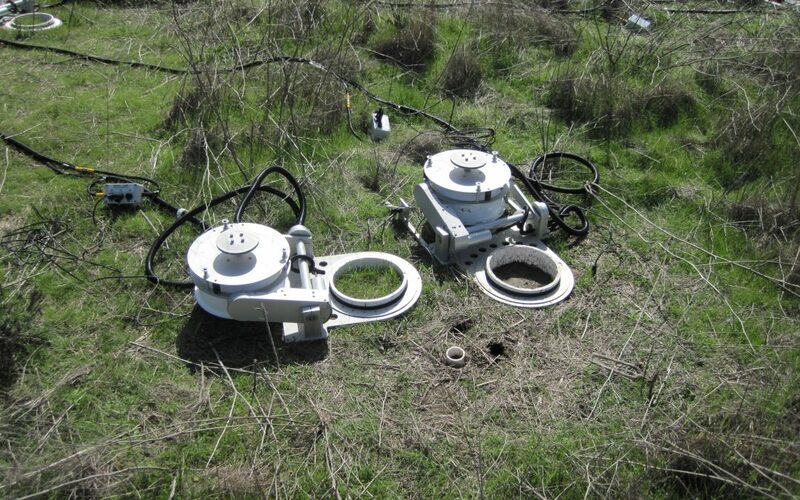 Graduated SDSU Doctoral student, Marguerite Mauritz, used automated LiCOR 8100 chambers (pictured above) to study soil respiration at SMER in plots dominated by either native shrubs or exotic annual plants. Invasive plants changed both the total amount of CO2 emitted from soils and also the seasonal patterns of soil respiration, and their responses to temperature and soil moisture. Her work showed that the interaction of plant invasion with altered climate will change the C cycle in this ecosystem.